Another day, another new set of social media statistics. According to Shareaholic, a content discovery and sharing platform used by 200,000+ websites around the world, 20% of all visitors to sites across the web in December came through Facebook and Pinterest. Those are pretty big numbers and considering that Pinterest is still a fairly new kid on the block, a definite success for them. While Facebook drove 15% of traffic, Pinterest was number two at almost 5% which shows its growing strength as a social media site – especially given that it is still a relative newbie. Between the two, they drove over 20% of referral traffic from social media platforms. 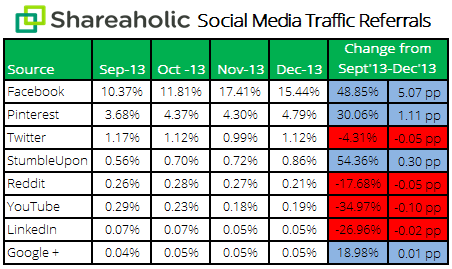 Twitter and StumbleUpon are 3rd and fourth respectively but overall very close in the amount of traffic they drive. What this means to you is that you should continue to invest time in social media and do so via the channels that are targeted to your most meaningful markets. One businesses success on Facebook is another’s on Twitter. Experiment. Remember though, changes in social media platforms, like the Facebook newsfeed, can impact the results of your social media campaign just a like a Google algorithm change. So like anything else, be ready and willing to adjust your strategy.